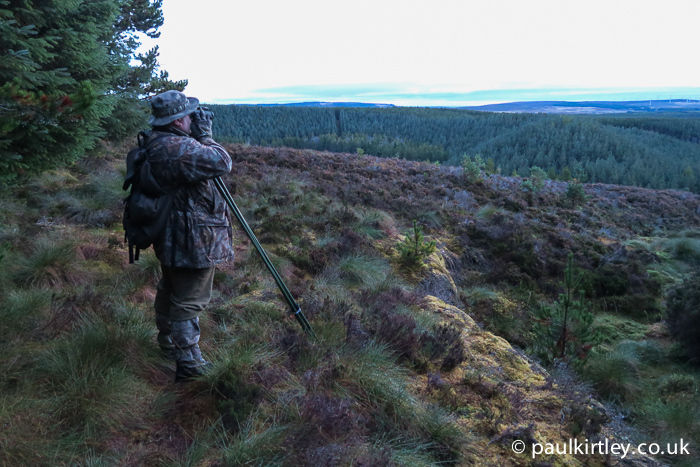 Andy Chadderton is a professional deer stalker and firearms instructor, based in Scotland, where he lives in a low key and relatively self sufficient manner. Andy started shooting when he was a boy and has been a pistol and rifle instructor for decades. He’s also a qualified range conducting officer. Andy loves to help people shoot to their best ability. As a deer stalker, Andy holds the Deer Stalking Certificate Level 1 and Level 2, as well as being an approved witness for others wishing to undertake assessment for DSC Level 2. Along with his colleagues, Andy also regularly teaches DSC Level 1 courses. He is part of the small but highly experienced team at the Stalking School, which is located in the North East of Scotland. I’ve known Andy for a number of years and we have always got along very well together. I like to visit Andy at least once per year, normally in October, after the River Spey canoe trips I do with clients. So, it was that I was staying with Andy for a number of days and, during that time we sat down to record this podcast. I was keen for him to explain what his work entailed, particularly for the benefit of a wider audience who aren’t so familiar with deer stalking, deer management or shooting in the UK. Click here to read or download the transcript of Paul Kirtley Podcast episode 011. Hi Paul, while I have enjoyed all the podcasts to date, this last one with Andy Chadderton is your best. While I am no longer a hunter (I made a personal decision to stop hunting 35 years ago) I still see it as an important way of life and something that if done correctly and with respect is perfectly acceptable. Mr. Chadderton’s ability to articulate the benefits of harvesting wild animals was very refreshing to hear. I personally would like to hear more podcast interviews with individuals like Mr. Chadderton. Thanks for your comments about my podcasts in general and this one in particular. I’m glad to read you appreciated the conversation between Andy and I. Many thanks for listening and I’ll do my best to maintain the quality of guests and the conversations we have in future episodes. Agreed. Thought this was a really interesting insight as to what goes on. stumbling disease in America. Thank You! Many thanks for sharing this podcast, it really was enjoyable and informative. I do not eat animals nor use animal products, for ethical and health reasons, but I appreciate the need for culling deer as part of, shall we say, ‘eco-management’ and I regard shooting as one of the more humane methods. I do personally however disagree with so-called ‘trophy hunting’ – such as paying a thousand pounds for the privilege of shooting a stag – as it seems to me to conflict with what Andy Chadderton says about the highly selective and informed nature of culling, which actually mirrors the approach of our ancient ancestors in terms of taking enough to live whilst ensuring the ongoing health and survival of the ‘food source’. Thanks to Mr. Chadderton and yourself for allaying any ethical concerns I may have had over deer culling; so long as everything is done in respect and necessity, all is well. Thanks for your well balanced and thoughtful comments. It’s good to have people such as yourself reading my articles and listening to the podcasts.